Earlier this year I noticed a new line of draws heading through the main overhang at Klinsey. From the top of Hardy Annual they blasted into the steepness, swung right along an obvious break line and then once again blasted out to the finish of the classic Mandela. It quickly transpired that this was a project of Neil Gresham's that he'd bolted the year before. I got on with getting Progress done, and then got sucked into weddings, stag-dos, failing on Northern Lights and bouldering for a while. 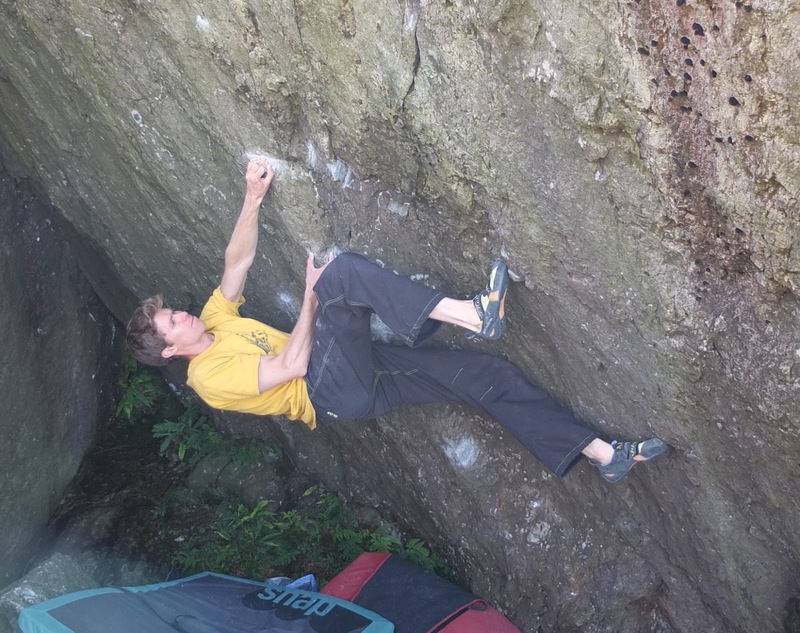 Despite the weight gain associated with the former two, I was chuffed to manage my first flash of a 7C+ boulder with Corridors of Power in Llanberis Pass. Now it was time to get stuck into Freakshow, which turned out to be as good as I'd hoped. At the top of the 7b there's a great no-hander in a kneebar, almost facing out down the valley - lovely spot for a quick breather! 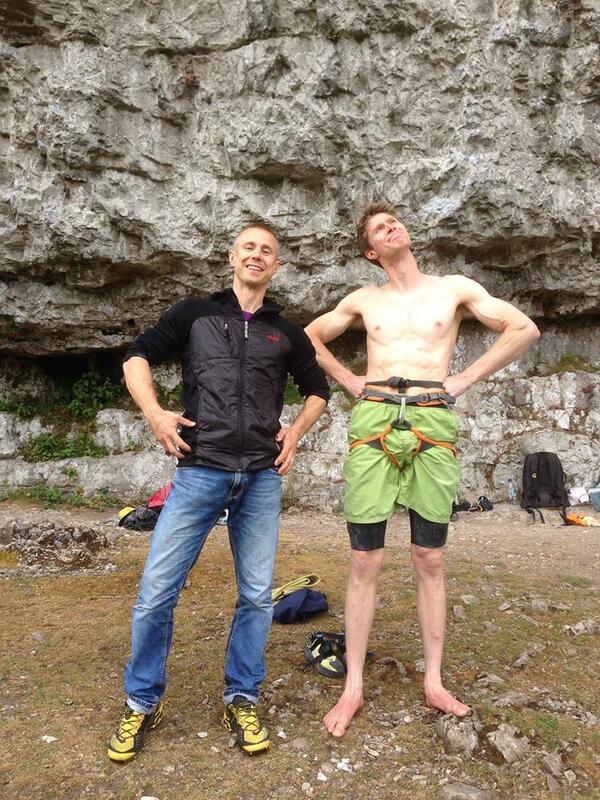 Then it's off up a few jugs and into the crux section, which is probably something like a 7B boulder. The break provides good holds but awkwardly high feet, and after a quick shake-out on a toe hook you plough on out into Mandela, via some really cool moves, joining it at the crux and finishing up that route. I found some really nice kneebar beta for this second crux - easier than Neil's method but brilliant! After a couple of days sussing the moves and beating myself up trying to find inventive rests I returned for the repdoint, and with a bit of a fight made it through to below the last few moves. Pulling into the final slap I let my mind get the better of me and lost belief momentarily; one of those times when you feel like you've fallen before you have and your mind whirs inexplicably quickly through thinking you'll fall to lambasting yourself for thinking like that to thinking you might be ok... fumbling the final hold I even stopped the fading lock for a split second as I was pulled earthwards, just enough to know that I hadn't really given it everything and could have tried harder. Despite feeling like an idiot and a punter, I couldn't help but smile whilst hanging on the rope. I much prefer falling off the top of something after a good fight than off the bottom, especially on a good route! A few days later I was back and everything went a lot more smoothly allowing me to make the 2nd ascent, I even managed to dry out the final wet rest while on route in a little homage to tales of Simon Nadin drying out holds on his onsight of Urgent Action years ago. Having had such fun getting pumped in the roof I decided to stick with it and moved on to try to make the 2nd ascent (as far as I know) of Epic Adventures, put up by Jordan Buys last year. As a line this is just as good as Freakshow, blasting out and leftwards from just before the end of Hardy Annual all the way to the lip. 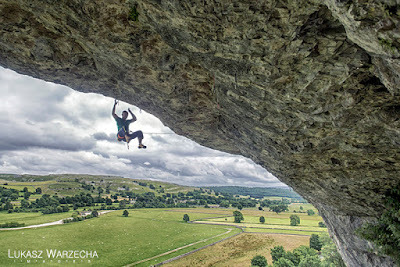 The climbing starts out fairly steady, then gradually gets more tricky and more pumpy until a cool sequence with a heel and some final thugging leads you round the top roof. Overall it's probably not quite as good as Freakshow due to being a bit more reliant on sika, but for sure it deserves more attention as the climbing is well fun and the positions are great. 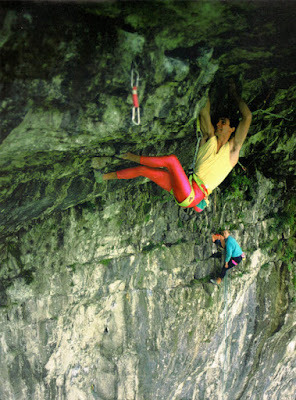 Jordan originally gave this 8b+, then changed his mind and upped it to 8c. For me I'd say that Epic felt like the lower half of 8b+, but I did leave my feet low on a few moves so it might feel trickier if you're not as tall. Freakshow felt probably bottom end 8c to me, similar in difficulty to something like Bat Route. Anyway, they're both well fun if you like getting pumped and climbing steep things so get on them and enjoy!